As the old adage goes, never judge a book by its cover or in this case a game by its art, screenshots, review score, etc. 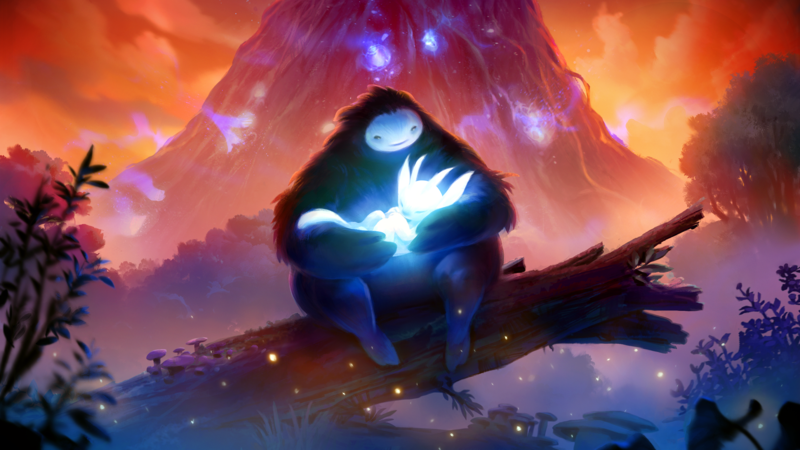 It’s a cliche but it’s especially true for Ori and the Blind Forest, a game that appears to be just another beautiful indie darling but will immediately and continually reveal itself to be so much more than the sum of its parts. 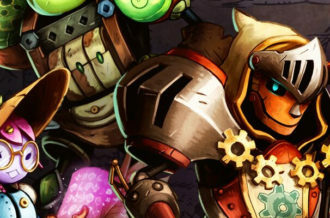 You may think you’ve played a game like this before by comparing it to classics like Metroid or Rayman, but there is nothing like the experience you’ll have in developer Moon Studios’ debut. You play as Ori, a forest spirit that’s left orphaned after a cataclysmic event destroys nearly all life and leaves an unstable world behind. Aided by a forest spirit named Sein and memories of a lost companion you set out to restore the forest to balance by gathering its natural elements. You’ll discover monster spirits impeding your progress and other life whose loss feels greater than yours. 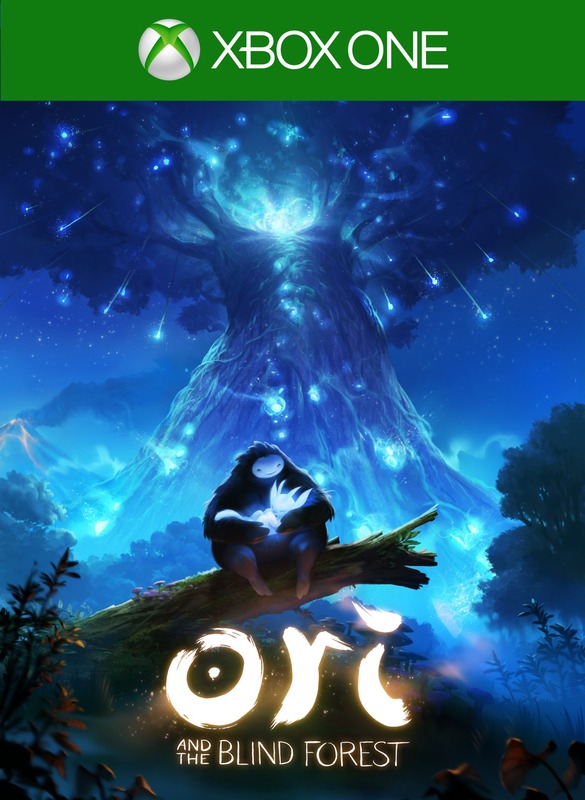 It’s an emotional story that stays with you throughout and while the character development is good, it’s not the reason Ori and the Blind Forest is a must play. 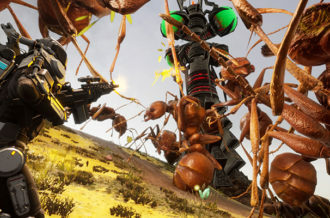 Throughout the game you’ll be treated to a hand-drawn aesthetic that harkens back to seminal childhood memories spent imagining what it would be like to fight the darkness in FernGully or wade the light pole size blades of grass in A Bug’s Life. 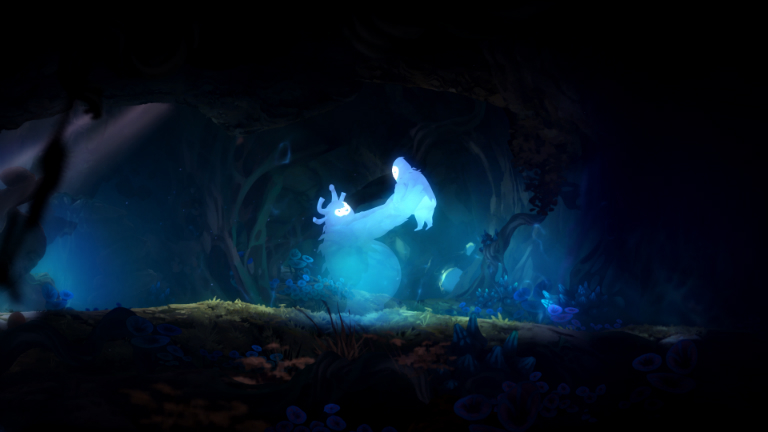 Ori and the Blind Forest even takes on a fairy tale esque tone reminiscent of Japanese animation classics from the vast Miyazaki library. That being said, every asset was individually created and while areas have themes in the game, you’ll never find anything copy and pasted. At any time you could stop and take a screenshot; there’s not one piece of art in this game that isn’t beautiful. Occasionally the game did slow down and have framerate issues which was surprising coming from a downloadable title on Xbox One, but that goes to show you how much they squeezed out of the visuals. I did experience one crash to dashboard, but it’s far from commonplace. The forest world of Nibel contains no loading times and feels like a long page in a pop-up book. You’ll find yourself zooming out to locate a destination and then zooming in to make your way there without any downtime. Backtracking and traversal in general feels less like a chore because of this and the secrets that open up as you unlock new abilities. 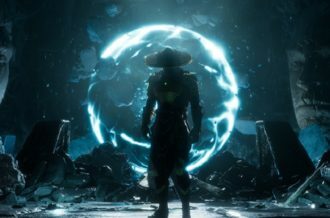 The Definitive Edition features an update that allows you to teleport between save stones which is a welcome addition in a game so vast and dangerous. At its, heart Ori and the Blind Forest is a masterly-crafted platforming game rewarding finesse and demanding better than you originally thought yourself capable. 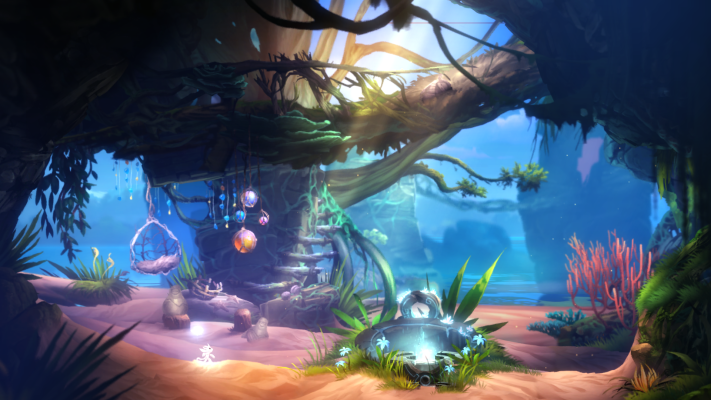 Ori moves impeccably through the forest of Nibel at lightning-fast paces that empower you to use a combination of instinct and memory. The game is cute, but you’ll find yourself dying time and time again as you just barely mistime an action. It’ll summon laughs, cursing and a couple vocal questions projected at the screen, but you’ll rarely feel cheated in your failings. There were times when I was quick to assume I’d finally caught the developers with an oversighted unreasonable request of the player, but I’d just as fast find a lightbulb over my head and a smile across my face. You’ll find yourself getting comfortable with a certain set of combat skills when taking down enemies as not every tool available to you will need using. There is a skill tree that is fully visible from the beginning, but you don’t even necessarily need to upgrade any of it let alone your combat abilities. The Definitive Edition of Ori and the Blind Forest does add an area of effect attack called Light Burst that allows you to survive situations when the enemies have managed to overwhelm you. It’s an addition that can improve your experience, but again you may find yourself never using it. You’ll jump around like Mario but you won’t be defeating foes in any way like the titular platformer. Instead you use fireballs that can only be fired rapidly up close and you’ll use the enemies attacks against them with a very unique ability called Bash. There are many interesting abilities that you’ll learn throughout your adventure but Bash is the one that keeps the combat together. Bash freezes time for a brief moment when Ori is close to an enemy, hazardous projectile, or occasional natural object. 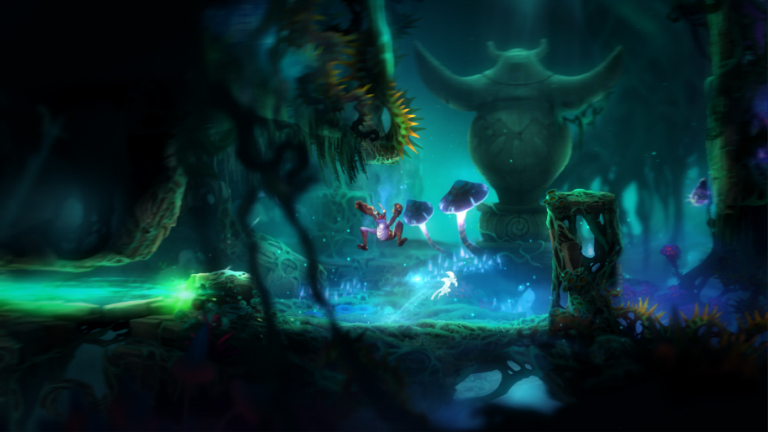 In this window you’re given the option to shoot the object in any direction and Ori will fly in the opposite direction. Bash can be used consecutively any amount of times and the game pushes you to use this for fast traversal, as a weapon, and in general just to gather information. The pausing allows you to center your thoughts and anticipate the actions of the obstacles in a game that plays fast and doesn’t allow for many errors. A particularly moving moment takes place as Ori is forced to use Bash to quickly climb out of a tree. The story beat is fast paced and forces you to play straight through without dying for an extended amount of time. That being said, just like the rest of the game, you’ll probably end up dying many times over before you make it out of this segment, but when you finally learn from your mistakes and the final jump takes place as the music crescendos, you’ll realize how much Ori and the Blind Forest is truly moving through you. The orchestral score is brilliant to say the least and becomes an essential component to building up these finer moments. Control is perhaps the most important element in any platformer, though when it’s good it normally goes unnoticed. Ori and the Blind Forest uses its tight maneuvering to create moments that have you holding your breath in anticipation. Often times you’re not sure whether or not you can make the jump until you try and then just barely land it. On the flip side, you’ll die when you get lazy and attempt to just autopilot through a scene. There were times when I had to slow down, laugh off my struggles, and bring myself up to the excellence Nibel demanded and deserved. There were also times where I wanted to remap the downward slam move because it triggered unintentionally. It tripped me up during the last third of the game, but I was able to power through. The feeling of accomplishment sprinkled throughout will leave you searching for a friend who’s played and will understand exactly what your journey stands for. 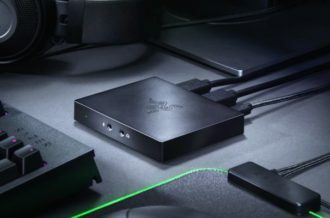 The Definitive Edition adds difficulty level settings starting with easy mode and working all the way up to One Life mode. 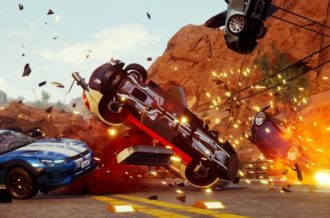 Playing on normal should be suitable for most players, but it’s great Moon Studios went back and catered to those looking for a different sort of challenge. There’s also two brand new environments that flesh out some of the character’s history. 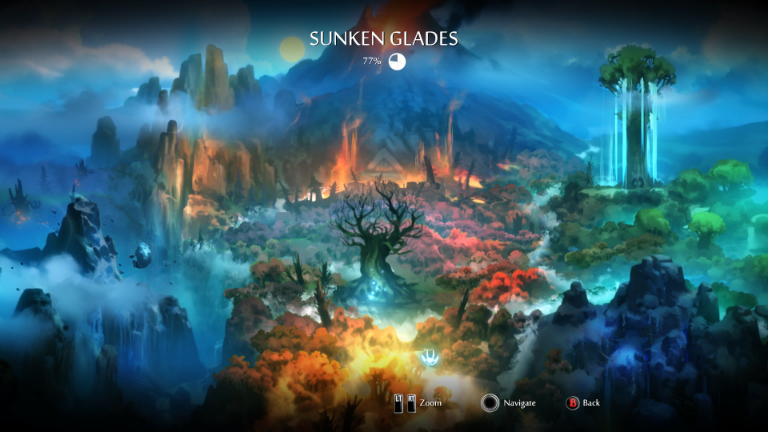 Ori and the Blind Forest was great when it first came out and it’s still great in the Definitive Edition. It has an emotionally effective story and gameplay that is worth the price of admission alone. Once finished you’ll come back to these comments to connect with someone who also understands the journey you took. Now go save Nibel in what’s sure to be a classic in the platforming genre.